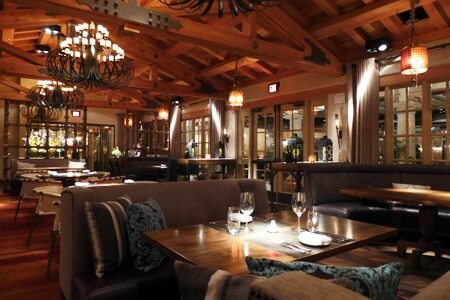 Rancho Valencia Resort & Spa's signature restaurant offers "Coastal Ranch" cuisine in a hacienda-style setting. Breakfast daily, Lunch Mon.-Sat., Dinner Tues.-Sun., Brunch Sun. : Rancho Valencia Resort & Spa's Veladora restaurant has a rustic yet sophisticated hacienda-style setting with wood beam ceilings, iron chandeliers and ample windows. The ambience is elegant without being over the top. A Damien Hirst butterfly art piece anchors the room, where guests tuck into spacious leather and fabric booths to enjoy "Coastal Ranch"” cuisine at breakfast, lunch and dinner. In addition to the main dining area, there is a private dining room with a fireplace, an al fresco terrace overlooking the tennis courts, and a courtyard patio with massive communal tables, a fountain and outdoor fireplace. Executive chef Jarrod Moiles and the culinary team present a pleasing menu with carefully planned dishes, starting with a lobster salad with roasted beet carpaccio and citrus grown right on the property. Among main dishes, pan-seared salmon might be accompanied by herbed couscous, harissa, spiced carrot purée and green olive pesto. Desserts favor comforting classics, like a warm caramelized apple crisp with vanilla ice cream, caramel and brown sugar streusel. The wine list includes private label wines produced for Rancho Valencia by Coomber Family Ranch in California. There is also a decent selection of craft beers, plus a fine tequila and cocktail program.